As I write this it is actually the day after what would have been the 94th Birthday of ‘MISS LOU’ JAMAICA ‘S FIRST LADY OF COMEDY, THE HON. LOUISE BENNETT-COVERLEY O.M. O.J. M.B.E. DIP R.A.D.A., D. LITT (HON). That however does not stop me from reflecting on one of my heroines and a Jamaican and African legend. As a Jamaican who loves my culture and the platform of enjoying the expression of my culture, I am grateful to Miss Lou for helping to create that platform. As will be seen in some of the highlights of her life, Miss Lou began celebrating our culture, especially the major African part of our culture, publicly with international impact, at the age of 14 with a poem that was done in Jamaican patois. This poem opened doors for her that would lead her into acting and eventually to spread her talent and the Jamaican language to the shores of England. Miss Lou created her legendary platform that was all about Black and Jamaican pride. Throughout her career she fought racism, sexism, classism, bigotry, xenophobia and various forms of oppression. I was fortunate to be born in a time when she was still alive (Miss Lou passed away in Canada in July 2006). 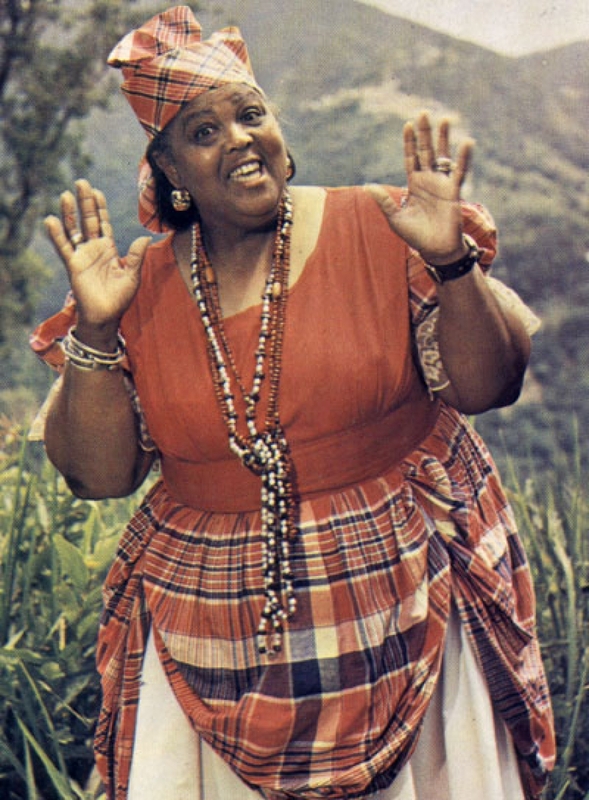 I was exposed to her very popular TV show (Ring Ding) on Jamaica Broadcast Television (JBC), the show was a children’s show that focused on Jamaican & African stories, poetry, folklore, art and other cultural manifestations. She always ended her show with her signature “Walk Good! …… Ai yah yah!” followed by a heartfelt laugh that I remember to this day. The show helped to foster a certain pride in my Jamaica “Africanness”. The show helped (with other things) to give me a certain confident poise, a swagger if you will, about being a black Jamaican and everything that came with African-Jamaican culture. In school her poems were the most impactful and most fun for me. The poems not only used my native in the most beautifully rhythmic manner, they also provided a window to the development of Jamaican culture over the years, while entertaining the reader in the most engaging manner possible. Throughout her career she was the pinnacle of theatre, poetry, comedy, television and other cultural art forms, and wherever she was she fought for and presented through an African-Jamaican perspective. HIGHLIGHTS: Louise Bennett was born on September 7, 1919. She was a Jamaican poet and activist. From Kingston, Jamaica Louise Bennett remains a household name in Jamaica, a “Living Legend” and a cultural icon. She received her education from Ebenezer and Calabar Elementary Schools, St. Simon’s College, Excelsior College, Friends College (Highgate). Although she lived in Toronto, Canada for the last decade of her life she still receives the homage of the expatriate West Indian community in the north as well as a large Canadian following. She was described as Jamaica’s leading comedienne, as the “only poet who has really hit the truth about her society through its own language”, and as an important contributor to her country of “valid social documents reflecting the way Jamaicans think and feel and live” Through her poems in Jamaican patois, she raised the dialect of the Jamaican folk to an art level which is acceptable to and appreciated by all in Jamaica. In her poems she was able to capture all the spontaneity of the expression of Jamaicans’ joys and sorrows, their ready, poignant and even wicked wit, their religion and their philosophy of life. Her first dialect poem was written when she was fourteen years old. A British Council Scholarship took her to the Royal Academy of Dramatic Art where she studied in the late 1940’s. Bennett not only had a scholarship to attend the academy but she auditioned and won a scholarship. After graduation she worked with repertory companies in Coventry, Huddersfield and Amersham as well as in intimate revues all over England. On her return to Jamaica she taught drama to youth and adult groups both in social welfare agencies and for the University of the West Indies Extra Mural Department. 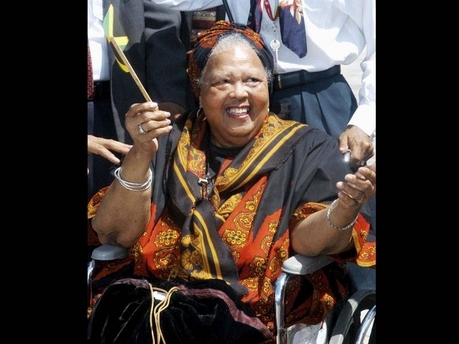 She lectured extensively in the United States and the United Kingdom on Jamaican folklore and music and represented Jamaica all over the world. She married Eric Winston Coverley in 1954 (who died in 2002) and has one stepson and several adopted children. She enjoys Theatre, Movies and Auction sales. In 1998 she received the Honorary Degree of Doctor of Letters from York University, Toronto, Canada. The Jamaica Government also appointed her Cultural Ambassador at Large for Jamaica. On Jamaica’s independence day 2001, Bennett-Coverley was appointed as a Member of the Order of Merit for her distinguished contribution to the development of the Arts and Culture. Honours: Several including, Member of the Order of Merit for her distinguished contribution to the development of the Arts & Culture, Jamaica, 2001; inclusion in Who’s Who in Black Canada (1st & 2nd editions, 2000 & 2006); recognized by the International Theatre Institute, Jamaica Chapter, as the “Most Important Theatre Personality of the 20th Century” (2000); Member of the Order of the British Empire for her work in Jamaican literature and theatre; Norman Manley Award for Excellence; Order of Jamaica for work in the field of Native Culture; Honorary Degree of Literature, York University (1988) and University of the West Indies (1982); Gold Musgrave Medal for contribution to the development of the arts in Jamaica & the Caribbean (1978). Works: Recordings: Include Yes, M’Dear: Miss Lou Live (1983); The Honourable Miss Lou (1981); Carifesta Ring Ding (1976); Listen to Louise (1968); Miss Lou’s Views (1967); Jamaica Singing Games (1953); Jamaica Folk Songs (1953). Poetry: Jamaica Labrish (1966); Anancy and Miss Lou (1979); Selected Poems (1982). Other publications: Aunty Roachy Seh (1993); Laugh with Louise; and Anancy and Miss Lou. Education: Royal Academy of Dramatic Art, England; St. Simon’s College; Excelsior College; Friends College for Jamaica. Hero: Her mother, Kerene Robinson. Motto: Use a smile to cover sorrow. The Jamaica Cultural Development Commission (JCDC) has planned a number of activities during the month of September to celebrate the 94th birthday anniversary of the late Hon. Louise Bennett – Coverley, OM, OJ, MBE. These activities will be held in each parish across the island and includes Exhibitions on the life and work of Miss Lou in collaboration with Parish Libraries; Concerts featuring her works in poetry, storytelling & songs; a special ‘Storytelling’ feature for the ‘Tweenie Weenie’ children; and bringing back ‘Ring Ding’ time, in Montego Bay. THIS IS ONE OF MY FAVOURITE POMES AND I FELT TO SHARE IT TODAY. 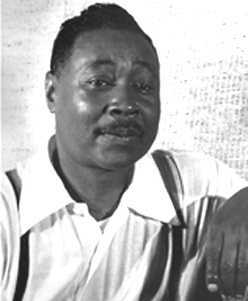 WRITTEN BY CLAUDE MCKAY IN 1919 (SEVEN YEARS AFTER LEAVING JAMAICA); The poem was a response to the vicious and horrible treatment of Black Soldiers after they returned to the US after fighting for the US in World War 1. The Poem was used several times throughout time for various reasons. Once it was used by Winston Churchill to rally London after the city was bombed by Nazi planes. O kinsmen we must meet the common foe!